The finishing touches of our Volleyball LED scoreboard comes with quality powder coating. 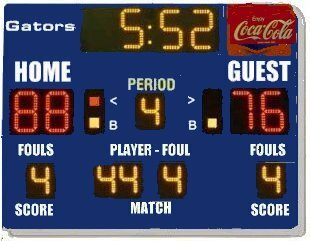 We can supply those in need of that special powder coating color for your scoreboard. Custom vinyl logos can be made from your artwork or use our expert graphic designers for that custom design. 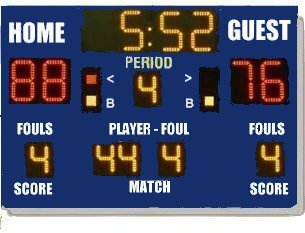 Being a quality - service oriented manufacturer of scoreboards making custom scoreboards seems to be the norm for us.. All of our volleyball scoreboards are made with quality LED displays. LED's last over 100,000 hours, are inexpensive to power, and easily to seen, even in sunlight. Our standard wireless hand held controllers are rugged and easy to use. Our system is configured so we just plug and play. Dimensions:93" high x 96" wide x 3" deep. Approximate weight is 250 lbs. Dimensions:96" high x 96" wide x 3" deep. Approximate weight is 250 lbs.